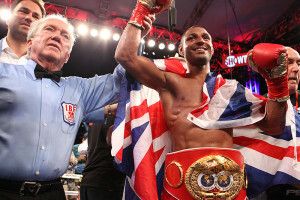 In Sheffield, on Saturday night Kell Brook impressively marked his return to the ring since May 2017, by making light work of Belarussian, Sergey Rabchenko, stopping him in the second round. Kell stepped on the gas from the first round, looking to take the centre of the ring and, whilst Rabchenko seemed game, the Sheffield native was clearly the superior boxer. With 1:52 left of the second round, Brook landed a beautiful right-hand uppercut, visibly shaking his opponent which set up the finisher, as Kell followed up with another big right hand, sending Sergey to the canvas, and keeping him there for the count. Arguably fight of the night, on an underwhelming undercard, was Gavin McDonnell’s unanimous decision victory over Gamal Yafai. Gamal, was unbeaten (14-0) going into the bout but as the rounds drew on, experience was king as McDonnell, now 19-1 (5KOs), began to dominate after the early rounds and there was no question over who had won when the final bell went. Hoping to avenge his May 2017 defeat to Lenroy Thomas, and fighting in running shoes, Dave Allen left the Sheffield Arena disappointed after an accidental clash of heads in the first round put an end to the rematch. Allen was stalking the Commonwealth champion early when, with 44 seconds left of the first round, the two butted heads as Thomas landed an uppercut. The referee immediately called a timeout as the blood came pouring from a deep cut above the ‘Doncaster De La Hoya’s’ right eye, and minutes later put an end to the bout, calling a technical draw.